Can fever and joint pain occur due to TB? 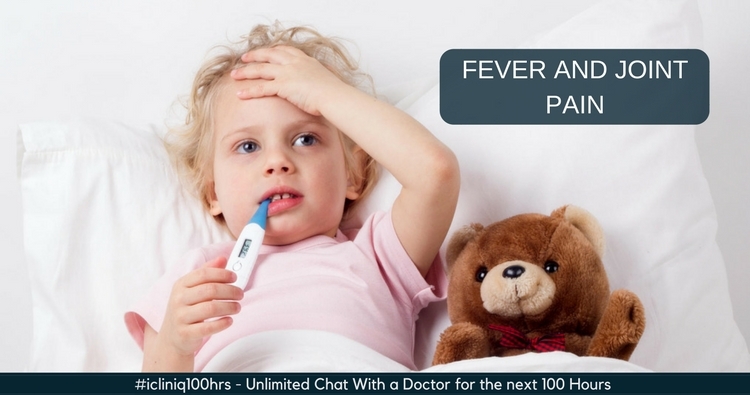 iCliniq › Ask a doctor online › Answers › Paediatrics › Tuberculosis › Can fever and joint pain occur due to TB? Q. Can fever and joint pain occur due to TB? Answered by Dr. Sirisha and medically reviewed by iCliniq medical review team. My daughter, who is 7 years old, is on ATT for the last five months. She had fever and knee joint pain on the right side for over one and a half month. Mantoux was positive and CT and x-ray showed hilar lymphadenopathy. Bronchoscopy, GL, bone marrow and CSF were done, but no AFB found. Malignancy also ruled out. Based on Mantoux and CT, ATT was started. Still fever persists though it was better for a few days after starting ATT. The fever used to be low grade and rising high at times and we had to give her Paracetamol. When she has a fever, she also has pain on joints such as knee joints, shoulder joints and sometimes, on sole. Once, she had a high fever of more than 101 degree Fahrenheit and she complained of acute pain in left knee and right shoulder joint. The fever did not go fully even after giving PCM 250. By the evening, the fever has gone completely and so was the pain. She was very active the next day. Again, she had some fever after two days. In the last 8 days, we did not give her PCM, but of course there have been low grade fever every third day like which goes again and she is still having problem with stairs (walking down). Also, we have noticed that her palms are hot most of the time. While holding her palm it feels so hot as if she is having high fever, but her forehead is relatively cool. She has hot palms even when she is not having a fever. I just wanted to know how long the fever will persist after starting ATT? What is the reason for joint pains? Sometimes, during fever, she develops nodes and red rashes in her sole, which is very painful. I have attached the photographs for your reference. Also, I have enclosed the test results of various investigations. Please give your opinions. I am really worried. • Am I suffering from tuberculosis? Please clarify from my CT report. • Fever and chills in a child of age 3 years 6 months. What can be done? Tuberculosis is a worrisome disease. As the kid has been already diagnosed with it and you have already started treatment, the symptoms should start resolving by now, since it has been two months already. If symptoms not resolving we should think of medication not being taken properly or regularly. Tuberculosis organism is very strong and has developed resistance to the medication being used. This is called multidrug resistant TB, which needs to be identified and treated with different medicines. This kind of TB is dangerous. Please consult your doctor there and they would guide you. The cause of fever could be something other than TB. She will need blood tests to rule out other infections. The joint infection, redness and painful rash can be caused by TB. TB can affect any part of the body. Some other conditions like rheumatoid arthritis and similar kind of autoimmune diseases need to be looked for. They will need special investigations. As for the rash, it usually disappears after a few weeks if it is TB related. Sometimes, we need to use steroid medications also. Better advice can be provided by seeing the child. You can follow up with your doctor and sometimes other specialists like dermatologist or rheumatologist might be involved. CBP (complete blood picture), CRP (C-reactive protein), ESR (erythrocyte sedimentation rate) and blood culture. My mother had TB meningitis and is now suspected to have tubercular spine. Help. How is multidrug-resistant tuberculosis treated?